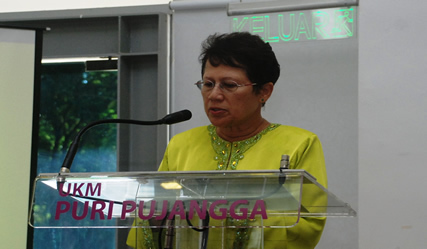 BANGI, 11 April 2012 – The digital revolution has not only transformed the technological world but has even affected various aspects of expressions including the pattern of languages and social behaviours of the people. Vice Chancellor of The National University of Malaysia (UKM), Prof Tan Sri Dato’ Wira Dr Sharifah Hapsah Syed Hasan Shahabudin opening the International Conference on Linguistics 2012, here yesterday mentioned how it has even changed the people’s behaviourial patterns. Organised by the School of Language Studies UKM on the theme Transformation and Innovations in Linguistics, the two day conference which ended yesterday discussed current developments in the field of linguistics. Prof Sharifah Hapsah told the participants from, Indonesia, Hong Kong, Africa, United Arab Emirates, Singapore and a number of African countries and Malaysia that people now do not speak to each other face to face but through various tools of communication technology. “We SMS, we e-mail, we blackberry chat, we tweet and in using such new tools we take short cuts with our language because messages are limited by characters” she said. This new language sacrificed grammar for the sake of expediency and is shunned by those groomed in the old school. She said that this new method of communication is considered incorrect and do not create value to users even though they helped to get messages across instantaneously and with brevity. These developments, she said, are inevitable because language is dynamic but questioned their implications on vocabulary, grammar and pronunciations in the future. She urged the conference to give serious considerations to the rapid development of the language in such a scenario as language is the very foundation of understanding and learning. Also present at the conference were the Dean of the Faculty of Social Sciences and Humanities (FSSK), Profesor Dr Hazita Azman and Chairman of the International Conference Prof Madya Dr Norsimah Mat Awal.